A two-woman show by Rimbun Dahan Yearlong Resident Artist 2018. Rimbun Dahan is hosting a two-woman exhibition from Jan 20 to Feb 3, titled You Belong to Night & Rojak Aesthetics, by Wong Xiang Yi and Chuah Shu Ruei respectively. 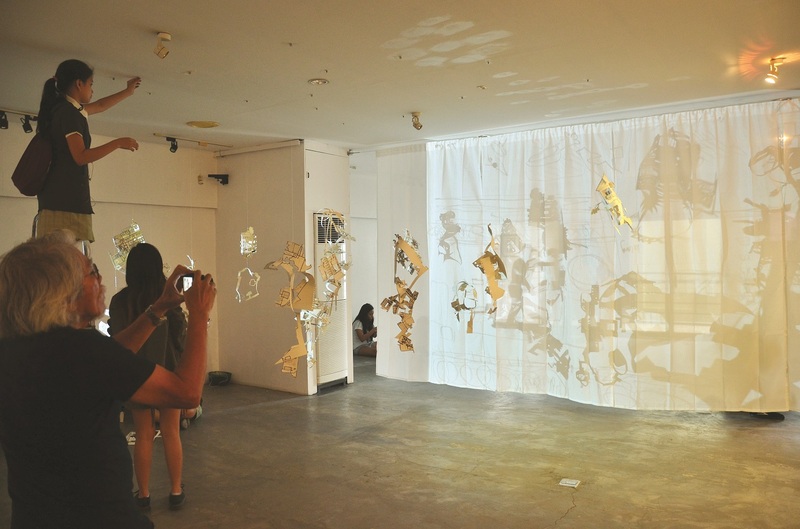 The artworks were produced during Wong’s year-long and Chuah’s six-month residencies last year at the private arts centre in Kuang, Selangor. Wong, a fine arts master’s graduate from Taipei National University of Arts, says her 27 ink paintings focus on her relationship with nature, inspired by Rimbun Dahan’s greenery. Chuah’s four installations draw on data and input from her collaborative projects with local communities and other artists that explore multiculturalism, interconnection, collective authorship and ever-changing compositions. She says the exhibition is a platform to publicly resolve the arc of Dunia-Kalibutan-Le Monde, a community art installation project carried out during her residencies in Reunion Island (France), Cebu (the Philippines) and Kuala Lumpur (in collaboration with social impact organisation HumanKind) over the past two years. It is also an opportunity to launch Toys for MY Children, her new community art project. "Rojak Aesthetics" Preview of installations by Chuah Shu Ruei. Experience the blurring of familiar everyday and a white space through the artist's presentation of worldviews. We invite you to come have fun and participate in the activities to contribute to these dynamic and expanding community projects. Open to public starting from 20th January. We will also be open on 26th & 27th January and 2nd & 3rd February from 10am till 6pm. Dancing in Place will be happening at Rimbun Dahan on 26th & 27th January starting from 3.30pm. On 3rd Feb at 9am, Angela Hijjas will be conducting a tour of Rimbun Dahan gardens and traditional houses. Chuah experimented, explored and developed different aspects of her art during her time at Rimbun Dahan. She believes the residency validates her career and gives it “a credibility that seems to affect the way people perceive and address me. It encourages them to approach me for projects as paid commissions, making a financially self-sustaining art career possible”. She does mainly community art installations and mixed-media object-based pieces and likes public art because of its connection with the notion of art being democratic and accessible to all. Social interaction as a form of art also resonates with this Aswara graduate. 'You Belong to Night & Rojak Aesthetics' is open to the public on weekends from 10am to 6pm. Visits during weekdays are by appointment (email Xeem Noor at [email protected]). On Feb 3 at 9am, Angela Hijjas will conduct a garden tour of Rimbun Dahan, which she co-founded with her architect husband, Hijjas Kasturi. All are welcome.